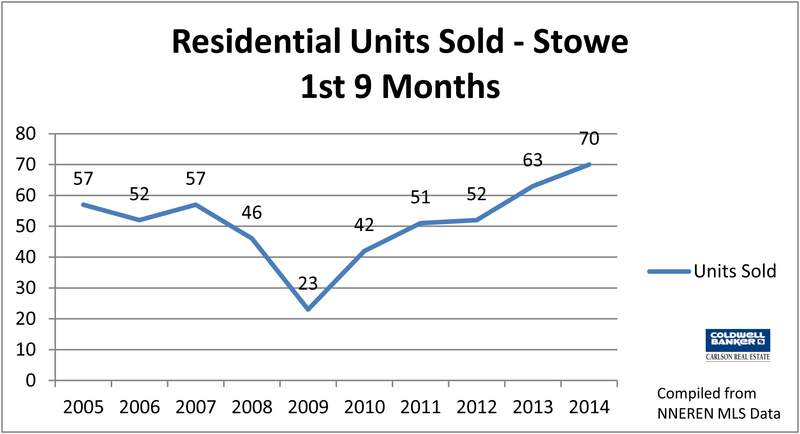 When looking at the last nine months of real estate sales in Stowe, you will see the continued increase in the number of residential homes that have sold. Sales are up again, 11% in comparison to 2013. The majority of those were still under $500,000, little changed from last year at this time, which you will see below in the 2nd graph. Home sales in the $500,000 - $1,000,000 price range have increased though, from 32% to 40%. And although there have not been any sales over 1,500,000 so far this year, there are currently 3 pending sales between $1,595,000 and $2,500,000. Continued low interest rates, consumer confidence, and buyer demand, all continue to help strengthen residential and condominium sales, although we’ve gone back to seeing residential inventory rise again, this time, by 20%. 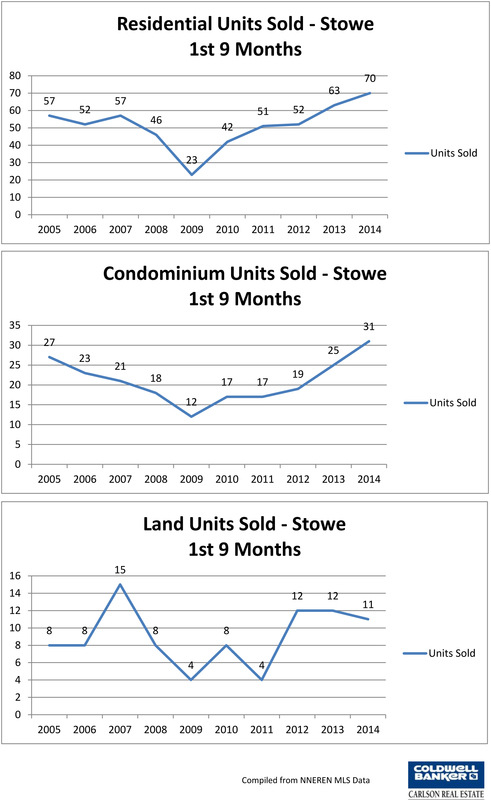 Stowe condominium and land inventory have both dipped though, 9% and 27% respectively. The median price for residential sales increased 28%, and the average went down 7%. The number of condominium sales rose again at the end of the third quarter. Not as much as after the 2nd quarter, but up 24%, nonetheless. The median and average sales prices both dipped, nearly the same as after the 2nd quarter, 29% and 27% respectively. 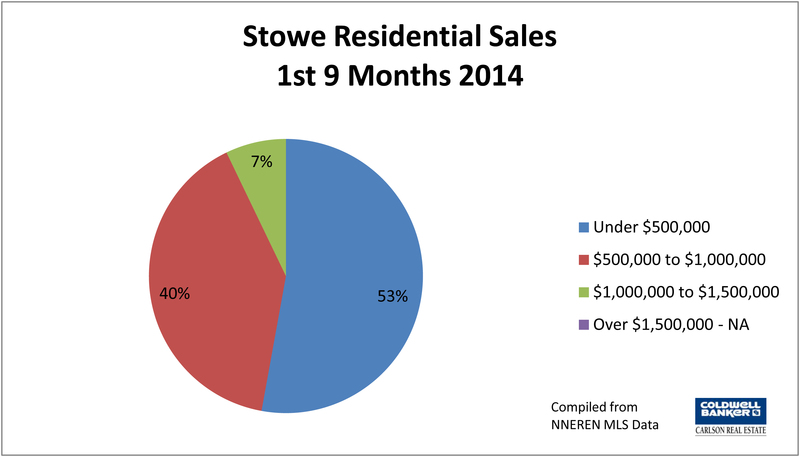 Land sales in Stowe remain generally steady, with a slight decrease by 1 sale. You will note that the average is way up. This is due to the fact that there were a couple of high end sales. One was a 27 acre parcel off of Birch Hill which sold for $565,000, and one in Robinson Springs, which is a 48 acre parcel where one house is being built. That lot sold for $1,200,000. The median price, in contrast was up 18%. Inventory in the land category decreased by 27%. The rest of Lamoille County saw little change, compared to this time last year. 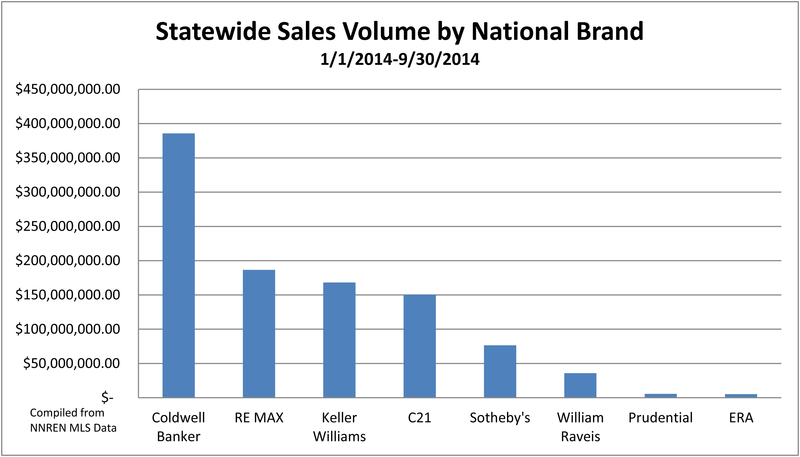 As you will see below, there was no increase in the number of residential sales. The median and average sales prices were virtually unchanged, and the inventory up, ever so slightly at 2%. 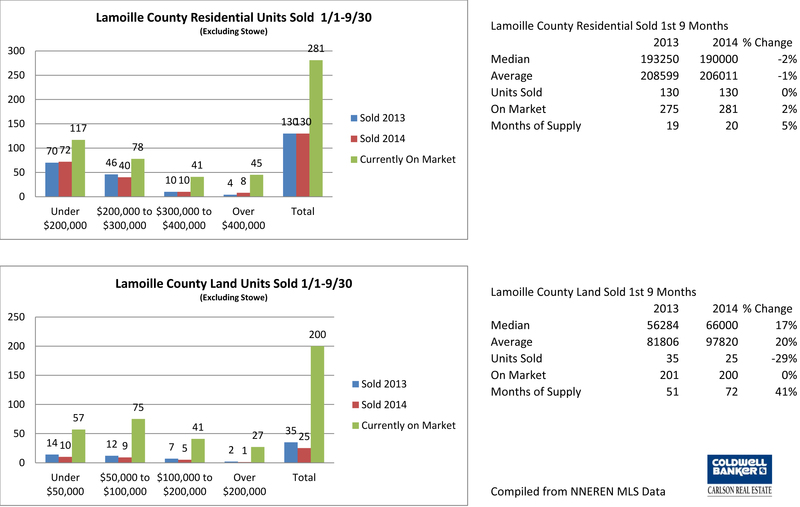 The number of land sales declined by 29%, and the inventory remained the same. All of the sales were $200,000 and under, with the exception of one that sold at $665,000. This is therefore reflected in the increase in the median and average prices, up 17% and 20% respectively. Purchasers have recently benefitted from additional home choices in Waterbury, with the advent of increased residential inventory. 7 of the sales were over $400,000, and the highest priced sale was $852,000. The number of sales, along with the median and average prices, dipped slightly. 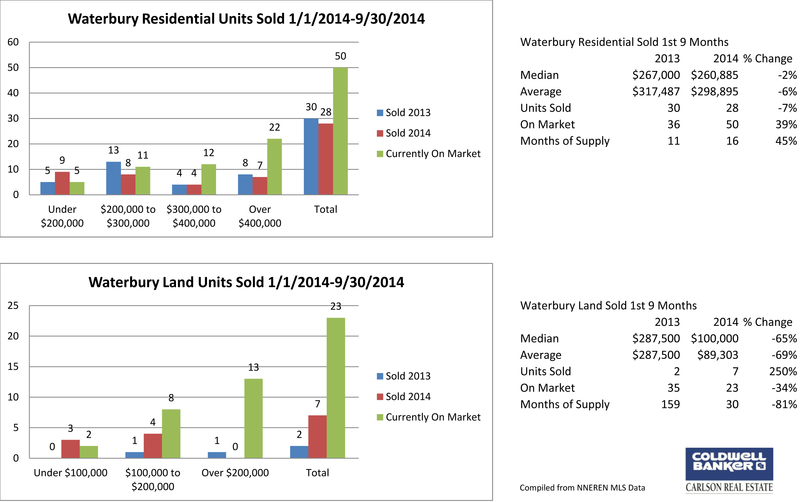 Waterbury land sales increased again significantly. Since it was an increase from 2 sales to 7, the increase shows as much as 250%. The majority of sales were under $100,000, thereby causing both the median and average prices to decrease. 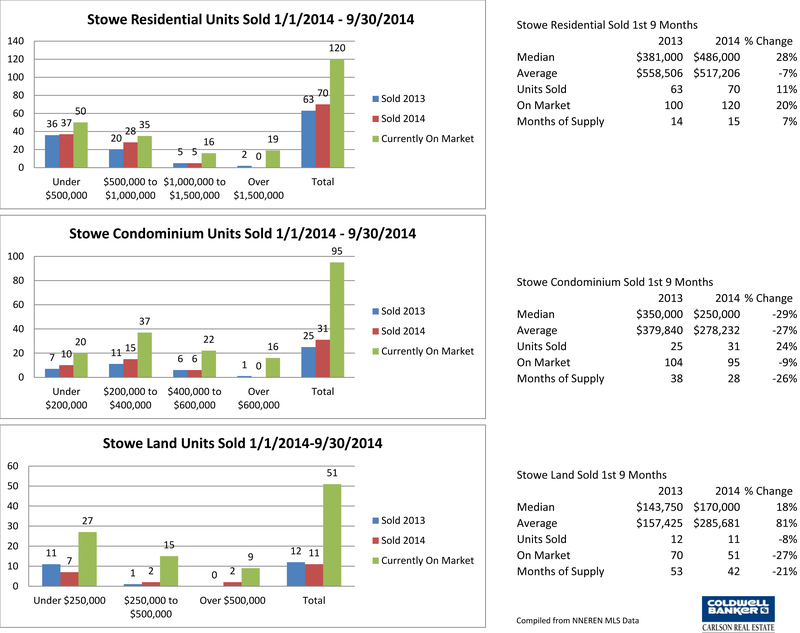 Inventory is down notably, by as much as 34%, so we may continue to see sales increase here. There are currently 2 pending sales which are in the higher price range, one listed at $169,000, and the other at $249,000. I look forward to the rest of the real estate year, and the upcoming winter season. Please let me know if I can help you with any of your real estate needs. If you have any questions about this report, or would like any additional information or statistics, please feel free to contact me at anytime.